I don’t reserve any one part of my heritage to an assigned part of me. In other words, I want to clarify from the start that the title doesn’t imply that only some of me is Spanish. If you want to be technical about it, then yeah. But in the heart of the matter, I am a beautiful blend of Spanish, Scottish, Irish and American. I hold the same love for them all. So with that clear, I want to introduce you to the Spanish in me. 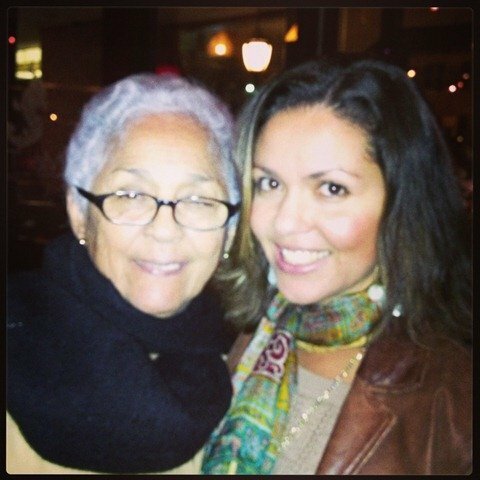 Me with my abuelita (grandmother), Dinorah. I love history, always have, and especially my family history. My passion for traveling has only reinforced this and even before my first experiences in Spain several years ago, I researched and learned even more about my Spanish heritage and family. Like all great things in life, it’s a story and it continues to unfold. 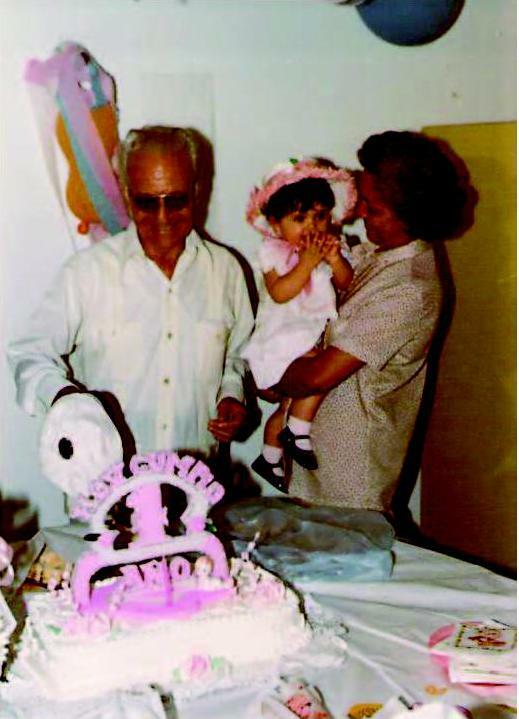 My 1st birthday, spent in the Dominican with my abuelito and abuelita. My mother was born in the Dominican Republic to a Dominican mother, Dinorah Abreu del Riego, and a Spanish father, Jose del Riego Orozco (known as Don Pepe). Now, a lot of people hear of certain places like the Dominican or Puerto Rico and think they’re all Spanish because they speak Spanish. Nowhere near close. We won’t even get into dialects here, but that is a whole other bucket of conversations for another day. Here’s how I explain it: Dominicans are Spaniard blood (people from Spain) mixed with the blood of the Taíno indians, natives of the island. Then, because the natives of Hispaniola were killed off so quickly, they were even more strongly blended with the blood of Africans who were soon brought over to the Dominican Republic as slaves. I love how even today the evidence of certain genes are apparent in my family. 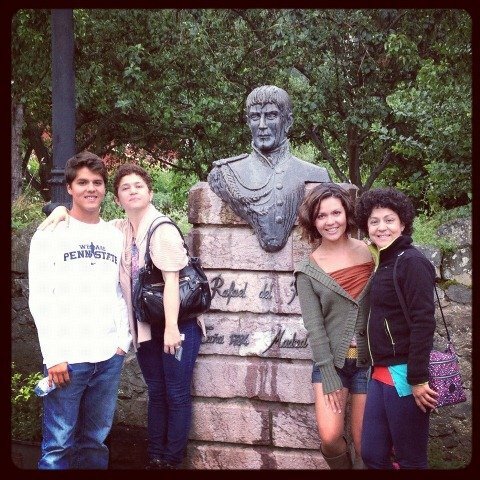 My mother, her sister, and even one of my brothers, have corse, super curly hair that resembles African hair. My abuelita (grandmother), has a slightly darker color to her skin than my abuelito (grandfather) did. 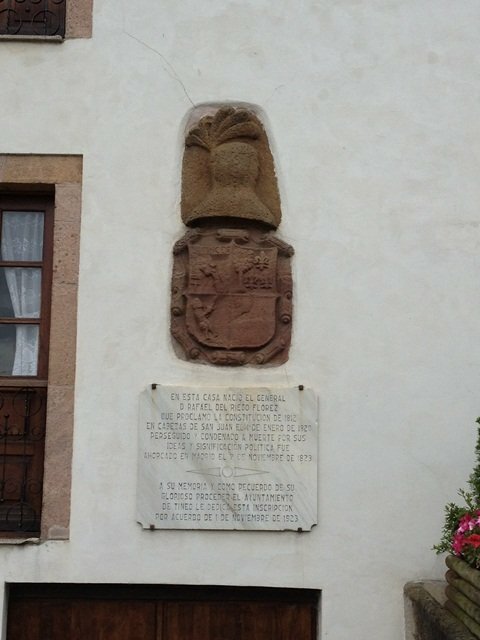 The del Riego coat of arms and historical building plaque. Time to journey back in time… The reason my abuelito ended up in the Dominican Republic was because he was exiled during the Spanish Civil War (1936 – 1939). If he had stayed in Spain, trust me, he would have been killed. Just before he was able to flee his homeland, he was imprisoned in a concentration camp just across the Spain/France border along the Pyrenees Mountains. And yes, there were already concentration camps existing even though this was just before WWII. If you think we’ve been taught about what was happening in our world around that time, go dig up stuff about the Spanish Civil War – you may be really surprised at how much is glossed over and ignored about this period of history. I used to think that the dictator of Spain at that time, Francisco Franco, and his Nationalist forces, especially disliked my family. But I realize that they didn’t like a lot of people, especially most of their own countrymen.What I’ve since discovered is that they were against what my family stood for, not just in the Spanish Civil War, but going even further back to the first Spanish Repiublic. My maternal grandfather was detained at the concentration camp at Argeles Sur Mer. I know it wasn’t the only camp but maybe our grandfathers were in the same one. I’m curious to know how yours got out. Mine escaped on foot! That is amazing that you know about your grandfather’s history and keep it in your mind and heart even now. I am not sure which camp my grandfather was at, but I can learn from my mother. Do you know what time period your grandfather was in the camp? I do know that my grandfather also escaped on foot with the help of some friends I believe. Let’s stay in touch and share what else we learn. I can see that it can be helpful to us both. I would also like to ask if you would consider writing about your grandfather’s experience as a guest blogger for my site? I would love to feature you and your own family history on my blog. Thank you again. I’m so grateful to be in touch! Hi Ana and Amalia, I am excited to hear about someone who might have been in the same concentration camp as your grandfather (my father). According to my father´s information he was in a concentration camp in a beach, right on the border with France and when they scaped (him and another friend), they crossed the Pirineos mountains to be able to reach France. When I was in Cataluña a friend took me to a small town crossing the French border and pointed to what would have been the beach where the concentration camp was. I don´t know if that helps, but I would love to continue to be in touch and hear about Ana´s grandfather.